Drag one or more spinners to the board. Choose color, number of sections, and labels. Click the spinners to spin. Drag one or more dice to the board. 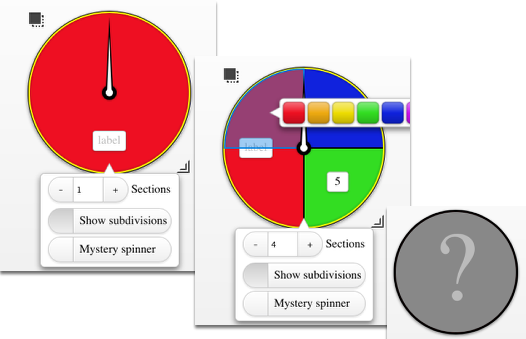 Redesign the die with a variety of color, dot numbers, or Arabic numbers. Click each die to spin. Drag one or more bags to the board. Choose the number, shape, and color of bag contents. Choose with or without replacement. Choose the number of items to draw. When finished, click the bad to shake and draw. Coins are labelled "H" for Heads and "T" for Tails. Drag one or more coins to the board. Click each of them to spin. Drag one or more decks to the board. Choose with or without replacement and the number of cards draw at once. Modify the deck by eliminating specific cards or entire suits or number. Click the deck to draw the cards. 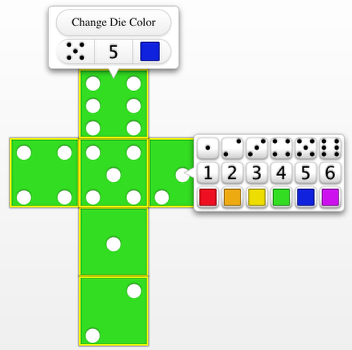 Drag the random number generator to the board. Indicate the number of integers to generate. Indicate the range for each random number.